Having invested 21 solid years into his music career, Bonsue Fuji creator, Adewale Ayuba still steered clear of the tussle for supremacy in the Fuji house. Perhaps what is undeniable is the way he has attracted more followership to the music genre, especially the Nigerian elites. With his intimidating number of awards and recognition, Ayuba is unarguably a silent achiever. One of the highpoints of his career is winning the 2005, Kora Music Awards' best group in Africa and the Best Group in West Africa Awards with his collaboration with Ade Bantu on Fuji Satisfaction. 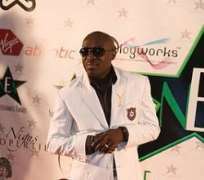 After he was signed onto the Sony Music Label, Ayuba's first album on thelabel, Bubbles, earned him instant success and brought him into limelight. The album which was released in 1993 top musical charts for several weeks and won four awards at the Nigerian Music Awards, (NMA) including Artiste of the Year Award, Album of the Year Award, Song of the Year Award and Best Fuji Album of the Year Award. In an interview monitored, recently on a Lagos-based radio Station, the Ikenne-Remo born artiste bared his mind on many issues in the industry, particularly the recent fight for supremacy among fuji artistes. My parents sat me down and spoke to me about my passion for music. They gave me a condition that if I continued with my education they would allow me to sing. I thought about it very well and told my parents that I would love to go to school. The first song I did then was Musulumi Ayuba but my first album is Ibeere (Beginning), recorded when I was 17. We formed a musical ban and I continued with this for three years until I was thirteen years old before I decided to go solo and formed my band known as Adewale Oriade Ayuba and His Future Fuji Stars. When I was just starting then, I would go to school during the week and devote my weekends to music. Those days when I performed, I would receive N20 and disappear home. Those were the days when Nigerian money was strong and for me to earn that amount was very fulfilling. Some of the things we used in conveying our instruments to show venues are still in front of our house in Ikenne Remo. We were four in the group but the remaining three have left music today. Up till date, I have recorded 18 albums altogether but three of them have been released so far. I was born in Ikenne Remo, Ogun State, Nigeria. I started singing at age of eight, featuring in local musical competitions and concerts in Ikenne Remo. I attended An-Sarudeen Primary School and had my my secondary school in Ikenne before I proceeded to Ogun State Polytechnic, Abeokuta, to study Architecture. If I were not a misician, I would probably have ended up as a lecturer. If we remove the will of God and guidiance of our parents, I think that is what I will be left doing lecturers are the only people who teach us the right paths in life and anybody who does this is the only person who can turn one's life around. I love the job so much. Well, it is my fans who are in the best position to assess my music because we the musicians perform and they are listeners. Firstly, I want to thank my parents because the education they gave to me is like lighting one's path. When I began to release records, things were a lot better then because the standards set by veterans like Chief Ebenezer Obey and King Sunny Ade is that, whatever song you sang would always make sense and rich with wisdom. It is this orientation that has influenced me till now. I don't just sing only for people to dance but for them to also learn. I came about the name Mr Johnson in Brazil. I had gone to Rio De Jaiero bay in 1987 with my brother and while walking on the streets, we met a white lady whose name was Sonia. She walked up to us and said “Hi” and we responded. She spoke further and said, “ You are very handsome, what is your name?” I thought about what to tell her for a while. I thought that my name, Ayuba might not make much sense to her (laughs), so I told her I was Mr Johnson. She told me she liked me and asked about my educational background and I told her I was a University undergraduate. I blushed so much that day (laughs) an later we became lovers. When it was time for me to come home, I didn't want to come back and because I would miss her, and I cried. So, when I got back home I made a song out of the experience and the name Mr Johnson really stucked. I won't call it a product of frustration, but after I had recorded five albums with large followership, I thought that my music had attained the level I wanted. However, my music was not popular among the elites. I didn't know how to go about it but when I joined Sony Music and wrote Mr Bubble, I thought that I needed to make it more appealing to them. I introduced new approaches into how people should dance to my music. Before then, I had never learnt dance formally. Days after the album release, I locked myself up in my house and bought a huge mirror and began rehearsing a dance. When the song gets to a line “ listen attentively, I am going to Bonsue….” I would flip my hand one way and was satisfied with the outcome. I went that way until the dance became a whole. When I began shooting the videos, my producers were fascinated and asked me how I came about the dance. I told them that it took me two months of practise. Well, my album entitled Gunshot is a product of an encounter I had with policemen in 2001. In one of my albums, I described Alhaji Sikiru Ayinde Barrister as my father. In another one I mentioned Alhaji Ayinla Kollington as my father. So, I don't joke with both of them and they also love me. During the burial of Alhaji Barrister's mother I was there. but I missed Alhaji kollington's mother's burial because I was not in town. And I deeply regret this but nevertheless wherever I am invited I will show up. But where I am not invited, I don't go; it is like gate crashing. For instance, my younger bother Pasuma, called me to perform at his birthday bash, I honoured it without hesitation. So, that is the way things work.